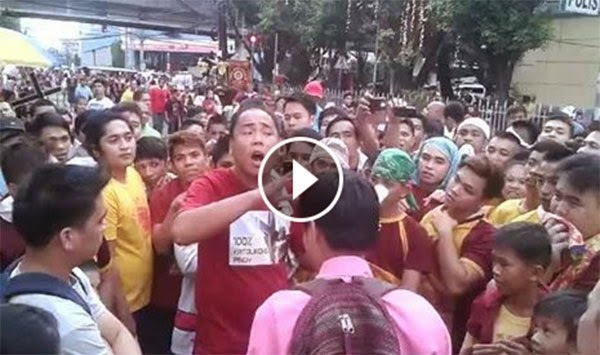 A video that captured a debate between a Black Nazarene devotee and street preachers who are members of an evangelical group has gone viral. Netizen Franz Tugadi posted the video on Facebook last January 10, a day after the Feast of the Black Nazarene. He said the exchange of words happened near the Manila City Hall. In the video, which garnered more than 6,200 shares and over 324,000 views as of this posting, two Born Again Christians can be seen arguing with one Black Nazarene devotee, who had plenty of allies who chanted as he defended his religion and faith. Outnumbered by Black Nazarene devotees, the street preachers left peacefully. One of them has been identified in a Rappler report as 25-year-old Paul Christian Faculin. His group reportedly gathered in Manila to preach their beliefs on the gospel as Black Nazarene devotees passed by Quezon Bridge to witness the "traslacion." "According to them, the procession is a showcase of idolatry and goes against the will of God," the report stated. Another report of same news outlet said Faculin's group goes to events they consider "sinful" such as gay pride marches and other "idolatry" gatherings. Idolatry is defined on Wikipedia as "a pejorative term for the worship of an idol or a physical object such as a cult image as a god, or practices believed to verge on worship, such as giving honour and regard to created forms."